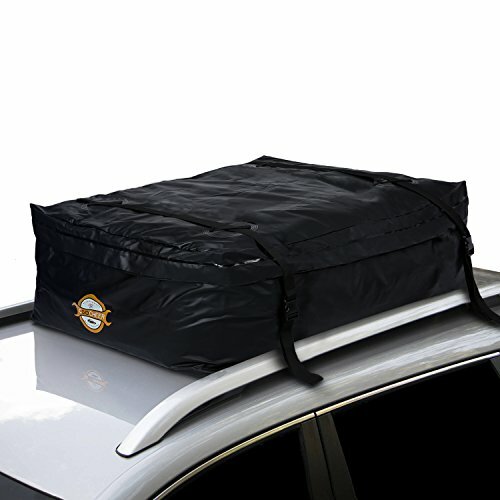 The Car Roof Carrier, waterproof, with covers the zipper in heavy rain,offers the best weather protection. Made with 600D heavy-duty polyester canvas, coated on both sides with abrasion-resistant waterproof vinyl (unique in the market). Withstands extreme temperatures, wind, sun, rain, snow, or sand. This Top Cargo Bag with 2 built-in strong, wide straps and 2 extra straps to ensure that everything stays in place even on rough and bumpy road,keeps Your vehicles Under Control, also Benefit all Your Life! Its soft material makes it perfect for carrying oddly shaped cargo thus creating additional space in your car, When it isn't in use, compact design allows you to fold and store it anywhere. Water Resistance:This cargo roof carrier is Crafted from rubber laminated nylon,to protect your gear and luggage from rain and dust on the road. Huge Capacity & Easy Store: The Roof Bag overall size is 48''x38''x18'', Carry 19.2 cubic feet worth of essentials,can increase vehicle cargo space without impeding on passenger comfort,more capacity, more pleasure! If you have any questions about this product by Adakiit, contact us by completing and submitting the form below. If you are looking for a specif part number, please include it with your message.